The Tour of America will solve the world’s biggest problem, by engaging in the world’s most universal activity using the world’s greatest example. 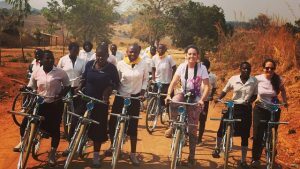 To review, we’ve made the case that global gender inequality is the world’s biggest problem (the “what”), and then we also explained why cycling is the world’s most universal activity (the “how”), so then what is the World’s Greatest Example? This is the “where” of the Tour of America, but bear with me, as there is is a bit of a meandering ride to our definition of the world’s greatest example. Let me start with what it means to be a great leader. Billions have been spent in the business world to understand the elements of “leadership” in an effort to find or create great leaders. Maybe this is why there are so few of them in the political world: unlike the business world, we don’t really give it much thought (or money), and inevitably, the mediocre or incompetent often rise to the top. But if we boil down “Leadership” to its essential elements, it’s very easy to find a starting point for what makes a great leader. Example – in which the follower observes the leader doing what that leader wants them to do and, with personal intent and authenticity, does what they are doing. Naturally, the greatest and most effective leaders are those that lead by example. Great leaders may not always be listened to, but they are observed and remembered, and ultimately emulated in a way and at a scale that force or coercion can never replicate. The unique power of leading by example is that it complements rather than conflicts with the principals of individual freedom and dignity. We choose to follow those types of leaders with maximum free will, and with that comes a great sense of personal commitment and motivation. For much of our 240-year history, America has been a great example – at least in principle – of what a country could and should be. We are forever a work in progress, less perfect than we would like and with our share of atrocities and force-related missteps in our wake, but we have somehow managed to develop and hold on to a collective consciousness of right and wrong. One of the miracles of America is that we still have a shared belief in the values of equality, individual freedom and the pursuit of happiness. And in our current age of disunity, we are, on some fundamental level, still united. Most of us believe we’ll get through this period of polarization even if we’re not crazy about admitting it right now. But we should at least admit this: We’ve seen and done worst in our past. Right now, the most important thing we can probably do is step back and figure out two things: 1) what is it that most unites us, and; 2) what is best about us. Consider that even the most controversial examples of peaceful demonstrations are at the very same time an expression of a belief in our country’s ability to be even better. Last weekend, over two million people around the country exercised that right, and that’s not something that happens in a lot of other countries that are led by force and coercion. The greatness of America is all about the example we set; our freedoms put us constantly on display for the world, and the world continually takes note. Whether we agree or not with the expressions of protesters, we take for granted at our own peril this powerful example that we set for the world: the simple fact that a person can protest without getting thrown in jail, tortured or killed. So even if we disagree vehemently on the message, we all generally agree on the right to express it. For us, it is a small kernel of unity in a nation of cacophonous discord, but for the much of the rest of the world, it is another compelling example of freedom that they can only envy. But protest is only a very small part of our example. While our political and economic foreign policy is trending toward disengagement, our global cultural impact has become more engaging than ever. And with an increasingly interconnected world, combined with the diversity of talented people that call America their home, our cultural values will continue to capture the attention of the world. For better or worse, we have never before been in a more powerful position to lead the world by example. And what an opportunity to set a better example! Because it is culture that really engages the imaginations of the masses, there is nothing stopping us from trying to set an example that will help solve a problem, maybe even the world’s biggest problem, and that’s where we come in. 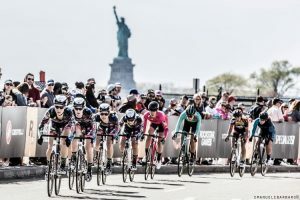 The Tour of America will celebrate and honor women, it will promote gender equality around the world, it will demonstrate the values of women’s empowerment and showcase the positive results that have been delivered by some of our nation’s most successful women. Our vision is that, somewhere at some point, young girls and women will witness the streaming images of women on a podium, and they will be enlightened, inspired and ultimately empowered to become part of a solution to one or more of the multitude of other problems faced by humanity, not just in America, but worldwide. 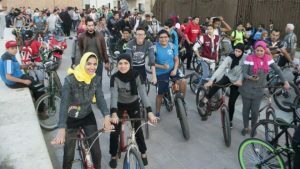 We will engage our audience through the world’s most universal activity (riding a bike), to promote universal values (freedom and equality) to solve the world’s biggest problem (women’s inequality) through the world’s most powerful cultural example (America). The example of the Tour of America is the example of America –unleashing innovation and fueling empowerment through our example of freedom, in this case, for that portion of half our world’s population that has yet to receive it. If, someday, we are privileged to have an audience even half the size of the Tour de France, we will be well on our way to fulfilling our mission. Thank you, France, for the Tour de France, and for that other woman on a podium, the Statue of Liberty. Now let’s get started! Please support the Tour of America by sharing our mission and message. Thank you!